Hey Stew, I need some help with a quick indoor routine as I am currently stuck inside due to baby, weather, and monetary reasons. I have no equipment and I am looking for a quick calisthenics and/or isometric upper body and lower body workout. If you have any great stomach / lower back workouts, that would be a great addition as well. There are a few components of a workout program to make it complete. Now you do not have to do all of these to get a good workout, but one thing I try to stress is complete balance in your workouts. That means you want to do some form of resistance training that will work your arms and legs, chest and shoulders. 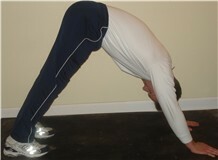 You will also want to focus on your torso - meaning abdominal exercises as well as lower back and upper back movements. You can do all of these with little or no equipment using calisthenics and isometrics with just your bodyweight. If you add in some dumbbells, elastic bands, or my favorite - the TRX, you can multiply your exercises tenfold. The remaining element is cardio-vascular exercise. Without any equipment you can walk in place, around the house, up and down steps, and pep it up a little with jumping jacks and jump rope. These components together make a complete workout and the added cardio work will get the heart pumping faster and help maintain cardiovascular health, as well as, a higher fat burning metabolism. I highly recommend doing something every day. That means not to do a full body workout a few times a week, but do a split routine where you do upper body one and followed by the lower body the next. You can mix in the abdominal and lower back elements as "rest" exercises as well as do short intervals of cardio options in between sets to recover muscle groups. Here are some sample workouts along with picture descriptions to help burn calories when you are "stuck inside". This is a great super cycle that will work the abs / lower back but also allow you to "rest" your arms from all of the pushups. The exercises above are designed into quick workouts that you can progressively make harder and harder simply by adding more sets or cycles to your workout.Another great addition to any calisthenics workout is the pullup. If you have a bar of some type in the house, then try it as a flexed arm hang or full pullup. Add pull-ups to your pushup routine perhaps every other set. 1) Get a deck of cards. Pick three exercises you like. One upper body, lower body, and stomach exercise. Go through the deck of cards one at a time and perform (for instance) a pushup, crunch, and a squat for each of the cards. Do the number of the card if 2-10, but all face cards equal 15 reps. Aces equal 20 reps. A joker will equal 25-50 reps depending on your fitness level. Get creative with this workout and change it up regularly. 2) Mix in step ups onto chairs or a low table for a hard leg and cardio mix workout. Simply step up and step down repeatedly. I hope this helps you make use of indoor time for the better.